Professional innovation is about creating a vision of your future business self by looking 1-3 years out (I recommend three years and will explain why in subsequent posts), and then taking several explorative steps to begin to achieve your vision. Whether you are an employee in a company, a business owner or developing your “side-hustle” business after work, the four professional innovation steps below will help you achieve your vision by pushing the boundaries of any limiting mindsets or beliefs, your skills, your fears, and well, your entire business self to the next level. If you aren’t uncomfortable, you aren’t innovating. You will be uncomfortable. You must learn and create something new or you aren’t innovating. You will learn new skills and you will test your professional limits. If you aren’t feeling pushed to your personal limits, your vision is too small. The definition of “want” is the desire to possess. When we say “I want” doesn’t it imply or feel like something tangible outside ourselves that someone else needs to provide? Doesn’t it feel like someone (your boss, your organization, your department executive, your supervisor, your team member, etc.) has to give or grant you the thing you want? Want is external. The definition of “need” is requiring something because it is essential and very important rather than just desirable. Doesn’t “need” feel like a shift toward a deeper, intangible need inside ourselves? Need is internal. (c) Use the items you checked (or added) above and describe in a paragraph what each checked item means to you. (d) Now that you have your list of wants/needs, write out your vision in descriptive and some “feeling” words and phrases. Ask yourself some questions like the ones below to further evolve your vision (and you can interchange want or need as you see fit). If you could achieve your vision, what words describe how you would feel? What is the next level of your business? What topics do you want to be talking about or are part of your daily business life? Who do you want to be working with? Why would this make you happy? What types of companies do you want to be working with? Why? What industry do you see yourself in? Why would this make you happy? Who do you want in your business life going forward? Who do you want to be associating with on a regular basis? What are some of the skills you know don’t have today but must develop? What limiting beliefs about yourself do you need to break to get further? What makes you scared to do today that you want to overcome for your future? What level of financial freedom do you need? What level of freedom in your work do you need? Describe how creativity manifests itself in your business life? What are you afraid of that might prevent you from achieving your vision? Who do you admire and would like to be more like in your business life? (e) Another way to create your vision is to have someone interview you and you speak and record your answers. Why? Sometimes we speak more freely than when we write. Since it’s a vision you are creating, not be limited in any way. (f) Lastly, keep a written or other visual that describes the aspects of your vision. Keep it handy for modification along the way (no vision is rigid) and keep it where you can see it every day. 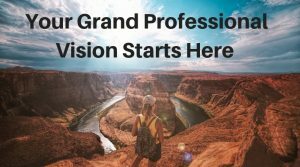 Now that you have a starter vision of professional self, this blog series of four parts will provide the next steps in your Professional Innovation. This entry was posted in Innovate the Daily Grind, Innovation, Innovation for Professional Growth and Promotion, People, Strategy, Vision by Amy Kelling. Bookmark the permalink.